Our home: Evansville is the third-largest city in Indiana, with a metro area population of approximately 300,000. Our outcomes: 94% of the Class of 2017 were employed or in graduate school within months of graduation. The median income for those employed was $47,750. 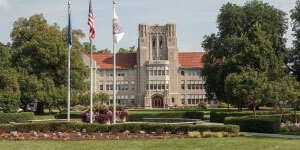 The University of Evansville is a private, fully accredited, liberal arts–based university with programs in the arts and sciences and in the professions. UE offers more than 80 different majors and areas of study. Affiliated with the United Methodist Church, UE shares the church’s commitment to inclusiveness. At the University of Evansville, you will find a warm, welcoming community that appreciates and celebrates diversity. The 2,002 students currently enrolled at UE represent 57 countries and 45 states. Located in Evansville, Indiana, UE’s attractively landscaped campus covers 75 acres. Several of its facilities, including Ridgway University Center and student townhouses, have received silver certification as Leadership in Energy and Environmental Design (LEED®) buildings. UE has earned several Excellence Awards, the top honor in the GreenOVATION Awards for beautiful and sustainable businesses. The transfer admission counselor personally guides each student through the transfer process. The transfer application is reviewed individually for admission and scholarship consideration. Every admitted transfer student is automatically awarded a UE merit scholarship, which currently ranges from $10,000–$15,000 per year based solely on academics. Phi Theta Kappa members earn a minimum $17,000-per-year scholarship. Need-based financial aid eligibility is determined by the FAFSA (UE’s code: 001795). The admission counselor will walk each student through their financial aid package, which includes all scholarships, grants, and loans available to the student. Every college transcript is evaluated individually to determine how those credits can transfer toward the student’s UE degree program. Transfer students are encouraged to visit campus to meet one-on-one with their admission counselor, professors in their field of study, career advisors, and current students. This is the best way to see if UE is the right fit for you. Once a student has made the decision to attend UE, they will work with a faculty advisor in their major to register for classes and build a graduation plan. Each UE student experiences a unique curriculum and a challenging atmosphere with hands-on projects and high-quality teaching. Faculty members, passionate about teaching, prepare students for success in whatever directions their careers take them. The student-faculty ratio at UE is 12:1, and the average class size is 18 students. In today’s world, new career paths are opening up, and existing jobs demand higher levels of skills and knowledge. UE prepares its graduates to be career ready as they begin their professional journeys. Our students participate in undergraduate research, professional practicum, and internships. They have access to real-world, cutting-edge equipment and techniques in specialized areas such as the UE Nursing department’s simulation lab. The University offers new programs and majors relevant to today’s job market in the areas of Data Science, Logistics and Supply Chain Management, Spanish Medical Terminology, Ethics and Social Change, and University Studies. UE students enjoy a rich on-campus experience through Greek life and other student organizations and events, community service opportunities, and leadership development programs. Off campus, the city of Evansville and the surrounding area offer such attractions as locally owned restaurants, museums, zoos, nature preserves, and amusement parks. Evansville is only three hours from St. Louis and Indianapolis and two from Nashville and Louisville.